Embark on the newest and biggest of the Royal Caribbean fleet on Symphony of the Seas on your way to little visited ports in the Caribbean including Philipsburg and St. Maarten. This ship boasts a zip line, mini golf, ice skating rink, and water park with slides, pools, and splash zones. The Symphony of the Seas is a brand new ship by Royal Caribbean, making its first voyage in the spring of 2018. This Oasis Class ship sails to Europe and the Caribbean. 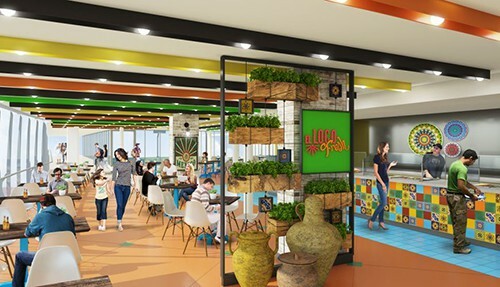 With room for 6,780 passengers across 18 decks, more than 20 dining options and tons of entertainment, this ship will wow its guests with all the available amenities. The Symphony of the Seas has seven different neighborhoods including Central Park and the Boardwalk, where you can ride a colorful hand-carved carousel. On the Royal Promenade, you can sip cocktails served up by robot bartenders at the Bionic Bar, or shop for fine art in the duty-free shops and galleries. Balcony suites overlook Central Park, resembling an urban-style high rise. There’s excitement on the water deck with a huge water slide called The Abyss, and a zip line nine decks high. For nightlife, Broadway shows, piano bars, karaoke lounges, and a comedy club provide entertainment for every member of your party. Teens have their own disco and game arcade too. Want to be one of the first to experience all of the marvels on this extraordinary ship? Make your plans with Dunhill Travel Deals. We’ll find the biggest cruise discounts, best promotions, and money-saving options so you can book a cruise that won’t blow your budget. Find exclusive specials, low rates, and amazing offers on our website and get ready to set sail on the adventure of a lifetime. No matter if you’re sailing with your family, on a romantic journey, or traveling solo, there’s always room for you on the Symphony of the Seas. There are 4 types of staterooms, each equipped with a TV, telephone, private bath with shower or tub, a vanity/desk and a hair dryer. These suites sleep up to four guests with a separate bedroom area, a sitting area with pull-out sofa and a private balcony. The full bathroom features a tub. These outside cabins are at least 287 sq. ft. with an 80 sq. ft. balcony. See the water views in these outside cabins with large balcony, equipped with outdoor furniture, two twin beds that convert to a king, and a seating area. These cabins are at least 274 sq. ft. with a 73-86 sq. ft. balcony, and sleep 2-4 guests. These outside rooms come equipped with two twin beds that convert to a large, king-sized bed. Accessible ocean view staterooms are also available with wider doorways, lower closet rods, higher toilets, hand-held showers and lowered vanity. Ocean view staterooms with pull-out sofas sleep two to four guests. These rooms feature a floor-to-ceiling screen showing the outside of the ship, including real-time dockside and water views. Affordable cabins include at least two twin beds that can be converted to one Royal king-sized bed. Some are also equipped with bunks and/or pull out sofas to accommodate additional guests. If you’re looking for a ship that’s full of fun, the Symphony of the Seas will not disappoint. Take the plunge down the Abyss, the tallest waterslide at sea; catch a wave on one of two FlowRiders, 40-foot surf simulators; or reach the heights as you climb one of two rock-climbing walls, which end with a view from 40 feet up. 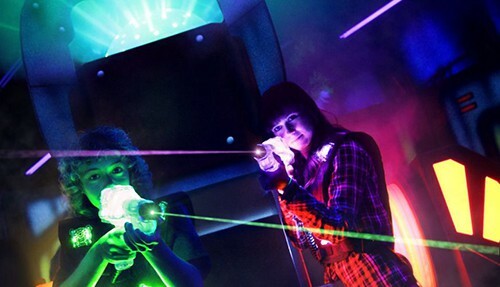 Choose your side, grab a laser and get ready for glow-in-the-dark laster tag. For the adventurous, there’s a zip line nine decks up offering a thrilling 82-foot ride over the ship. After the excitement, indulge and unwind in the Vitality at Sea Spa; or lace up your skates and practice your figure eights on the ice rink. For the young ones, the Symphony of the Seas offers the Adventure Ocean Youth Program and the Royal Babies and Tots program, along with a teen lounge and disco. Splashaway Bay is a water park just for kids. The Symphony of the Seas has a meal for every occasion. 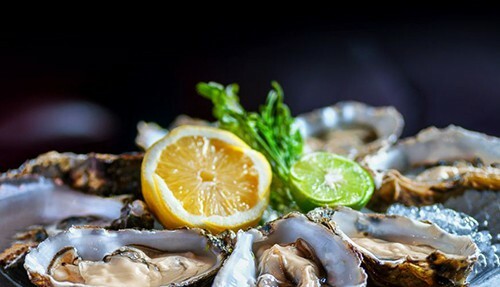 Guests choosing the Main Dining Rooms will enjoy the world-renowned Gold Anchor Service, with a varied menu offered during two dinner seatings. For more flexibility, guests can opt for My Time Dining and visit the dining rooms and specialty restaurants whenever hunger strikes. Johnny Rockets-Old-school 50's diner experience as you enjoy a juicy burger and fries and tunes from the jukebox, and of course old-fashioned malted milkshakes!